Now it is even easier to start with Watlow® for all your thermal needs. Watlow SELECT™ enables you to quickly identify, configure and receive your thermal products faster and easier than ever before. 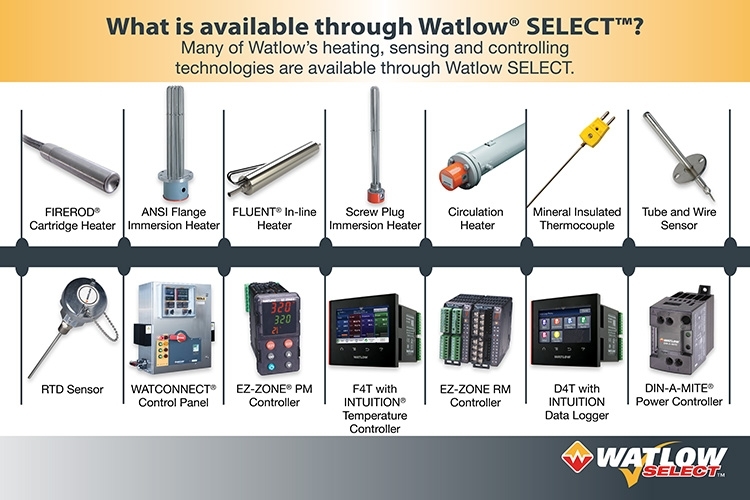 Watlow SELECT includes many of our most popular heater, controller and sensor products. Most ship in five days or less. With SELECT, you can search online, use tools such as drawings, user guides, white papers, etc. to guide your decision, configure products for an exact fit and quickly receive your order. With Watlow SELECT, the world of Watlow is now at your fingertips. Enhanced watlow.com navigation provides direction to the best products for your application. Catalog pages are marked to identify Watlow SELECT products. In addition to providing our most popular products faster, we have also added many tools and features to www.watlow.com as part of the Watlow SELECT user experience to assist in finding the right product to do the job. Look for the Watlow SELECT logo as you navigate the site for our most advanced tools and product guidance. The Watlow SELECT Application Guide starts the process of identifying the most appropriate products to solve your challenging thermal problem. The system view assists in identifying the necessary components to complete your thermal system. With easy-to-use check boxes you can filter for the features and specifications that are important to your application. Product configuration tools provide guidance and visual feedback confirming feature choices from thousands of configurations. With the Visual Designer™, what you see is what you get. The new Watlow SELECT Visual Designer uses imagery to quickly and effectively communicate the features of the product you are designing. This customer design tool uses pictures for product feature menus, and provides a constantly updated drawing of the product you are configuring. That means no more memorizing code letters or part numbering structures. Click the features you need and watch them appear in the drawing. Picture menus in the left panel make it easy to choose the correct product options to fit your application. As you complete the design, the drawing on the right side changes to reflect your feature choices. Throughout the process, tool tips and value ranges are displayed and suggested to assist the design process. Drawings, user guides, white papers, brochures, specification sheets and other documents are available online. We know that most of our products are components in larger systems making it critical to have access to product documentation that explains features specifications, certifications and start-up procedures. Many of these are available through Watlow SELECT. As new products are developed, and more enhanced documentation is created, look for download instructions included with your product. Some of our more recent SELECT products such as FLUENT®, WATCONNECT® and the new ASPYRE® power control series have engineering drawings and 3D models available for download. All products that have the new Watlow SELECT Visual Designer tool provide outline drawings that can be copied from the application. Future tool development will provide downloadable engineering drawings and 3D models for all SELECT products. Choose the lead time you need — from guaranteed one-day expedited shipment or five days or less standard shipment — for most SELECT configured products. System components are stocked and ready for rapid assembly on short notice. If the order is received before 12 p.m. CST, it will ship that day. If the order is received after 12 p.m. CST, it will ship the next day. There is a $125 or 25 percent (whichever is greater) expedite charge. Five days or less shipping is standard at no extra charge. This shipping option is available on our WATCONNECT control panels.